If I had to choose my favorite kitchen appliance, it would be a close call between a microwave and crock-pot. A microwave is wonderful for cooking bacon, baked potatoes, fresh corn-on-the-cob and popcorn. It also does a great job melting butter and chocolate and, its most popular function, heating leftovers. A crock-pot can be used to reheat soups, stews, chili and spaghetti sauce, plus an entire dish can be cooked in it with little or no additional work required. It's a tough choice, but for the last reason alone, I'd choose a crock-pot over a microwave. Although I love crock-pot cooking, I haven't posted many crock-pot recipes. Today, I want to rectify that and share one of my all time favorite crock-pot recipes. The crock-pot version of Chicken a la King isn't that much different from the version cooked on the stove. 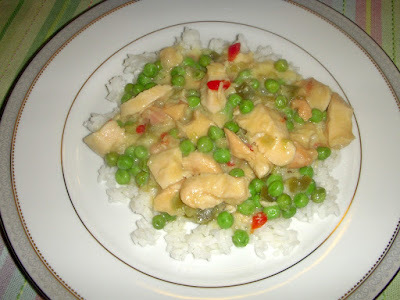 Both recipes contain diced chicken with vegetables in a cream sauce. The most obvious difference is the crock-pot version takes eight hours to cook. However, there are several advantages to this long cooking time. First, unlike the version cooked on the stove, the crock-pot recipe doesn't require the chicken or green peas to be cooked ahead of time. Second, the vegetables -- onion, green pepper and celery -- don't need to be sauteed. Third, you don't have to make and thicken the cream sauce. To save time, assemble the ingredients the night before. Start by combining the flour, pepper, cayenne pepper and -- what makes the cream sauce -- cream of chicken soup. I use 98% fat-free soup which has less sodium than regular soup. For that reason, I also add a teaspoon of salt to the mixture. Add cubed chicken breasts and diced onion, celery and green bell pepper. Thoroughly combine the ingredients and store the mixture in a covered container in the refrigerator. The next morning, put the ingredients in the crock-pot and cook on low for 7 1/2 hours. You may be wondering why the green peas aren't in the crock-pot. The peas and pimentos are added at the end of the cooking time and everything is cooked an additional 30 minutes. The peas need to be thawed before being added to the mixture. I find it helpful to put the package in the refrigerator to thaw when I put the chicken mixture in the crock-pot. Chicken a la King is usually served with toast points or pasta, but I like to serve it with rice. Shortly after I add the peas and pimentos, I start cooking the rice. By the time the rice is ready, so is the Chicken a la King. Add a salad and you've got a meal that doesn't require a lot of work or a lot of cleanup! Combine the first four ingredients in a crock-pot until smooth. Stir in the chicken, celery, green pepper and onion. Cover and cook on low for 7 1/2 hours. Stir in peas and pimentos. Cook 30 minutes longer until heated through. Serve over rice. *If using 98% fat-free soup, add one teaspoon of salt to the mixture.